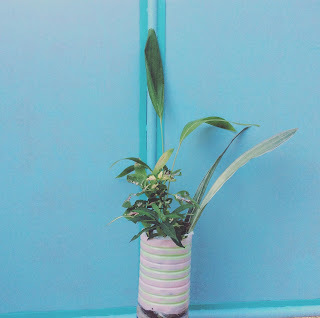 So, here are my initial projects from 3-liter water (plastic) bottles. 1. Cut out the upper portion retaining the bigger lower portion. 2. Wash the empty bottles. 3. Let dry by turning them upside-down. 4. Paint the inside with desired color combos (I used acrylic paint). Remember to let dry the first color before starting with another color, else, the colors will mix! 5. If you want to accentuate further, I decoupaged the outer part with vintage-style die-cut butterflies. Just make sure to seal them properly so as not to ruin in first watering! If you know how to control your watering the plants you are going to place in them, you may leave them hole-less. Otherwise, heat a 3-4 inch nail over a candle then pierce through at the lower side at least 1-2 inches above the bottom. You want the paint design to last longer? 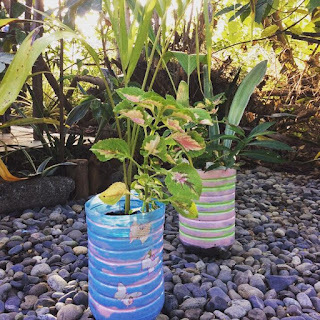 Use plastic bag pottings to protect the upcycled pot from the soil, plants & elements. You can use them as thrash cans as well!